Hello friends! 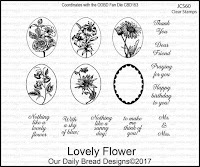 Today we are looking back at the Our Daily Bread Designs April 2017 Release. 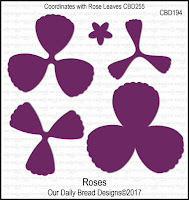 The Bread Stick Designers have created more beautiful samples using the fabulous new dies and flower stamp sets for your inspiration. 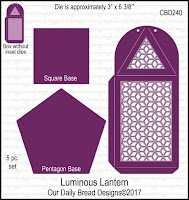 I've created another Lantern and card gift set for my sample. Creative Nugget: Five panels were cut with the Luminous Lantern Die, one with the inserts which was used for the front panel. Paper from the Chalkboard Collection was cut with a Lavish Layers Die and triangles were traced from the Luminous Lantern Die and fussy cut to layer onto four sides of the lantern. The lantern was assembled with the flaps at the top folded in and tied with ribbon. 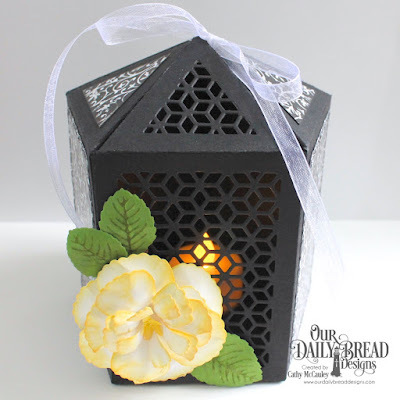 The new Rose Dies and Rose Leaves Dies were used to make the flower on the front and a little LED votive was placed inside the lantern. 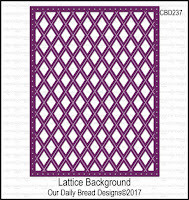 Creative Nugget: The Lattice Background Die was used to cut some black card stock which was adhered to paper from the Chalkboard Collection. A section of this panel was cut away and the two remaining sections were stitched to another layer of black card stock cut with the largest Pierced Rectangle Die. 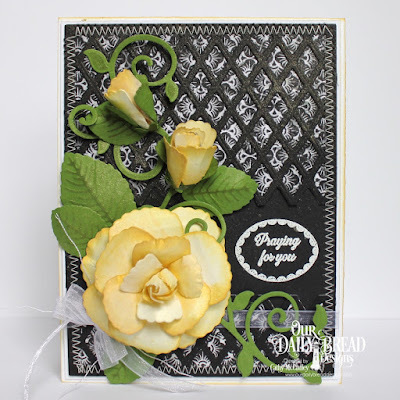 The sentiment from the Lovely Flower stamp set was white embossed. 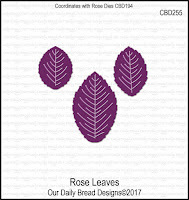 The Rose Dies and Rose Leaves Dies were again used to make the flower and buds which were mounted to a Fancy Foliage die cut. Some sheer ribbon and a bow were added to finish the card. 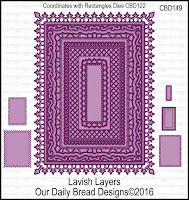 To see all of the wonderful projects created with the April Release, hop on over to the Our Daily Bread Designs Blog. Then click the links below to see the details for each project. 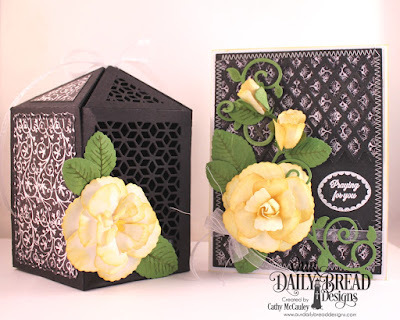 Cathy, those card and box are GORGEOUS!!! Love the black and yellow color combo. Your roses are stunning. Thank you for the inspiration. Beautiful creations!! Love your flowers! Beautiful samples, Cathy! Love the color combo, gorgeous roses! 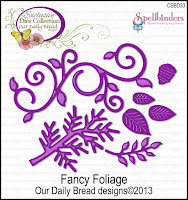 Hi there, what a beautiful project, love the colours and fantastic flowers. This is SO cool! 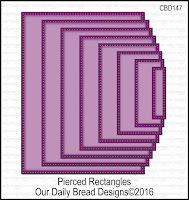 I just love how intricate the pair of your designs are!!! Elegant perfection. Thank you SO much for playing along at Fusion. My goodness, that lantern is absolutely gorgeous and put together perfectly. And I love the matching card you created. The flower and leaf elements are so detailed and really pop against the black lattice background. And being a Golden Retriever owner I just have to say your blog header photo is simply beautiful. So glad you joined us at The Flower Challenge! !